So, you just got a brand new EMF meter and you’re walking around the house measuring stuff. The meter is making noises, lights are flashing, numbers are appearing on the screen, and you’re asking yourself, “What is a high EMF meter reading?” or “Are these readings at dangerous levels?” These are great questions, and in this post, I want to break it down for you and explain what a high reading is, and why we should be concerned when we get numbers above those readings. Disclaimer: These are my own conclusions based off of many hours of research. In this article, I’ll go in depth about why I came to these conclusions, the sources that I gathered information from, and why many regulatory agencies are not being realistic about safe levels of radiation. What Is A High EMF Meter Reading? 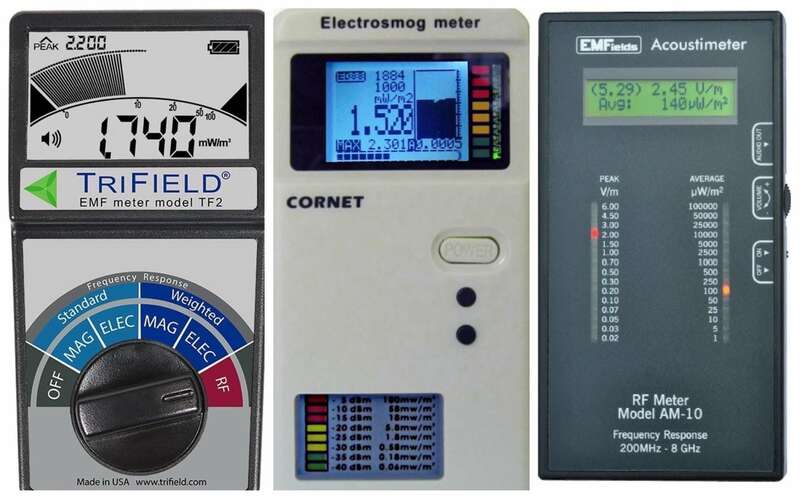 So let’s break down what we mean by “High EMF Meter Reading” first. There are so many meters on the market, and all of them max out at different amounts, and many even use different units of measurement. So, for the purpose of the post, we’re really going to just talk about the dangerous levels of the magnetic field, electric field, and radio frequency radiation. Obviously, these levels will fall far below what your meter maxes out at, but I think it’s helpful to know at what level you should begin to be concerned so that you can take action and lower your exposure. Let’s talk about each one individually. I just want to note, that it is a little bit hard to pinpoint at what level of EMF radiation harm takes place because so many researchers, organizations, governments, and regulatory agencies disagree on these levels. We’ll talk about this though moving forward. Summary: Magnetic field readings within living spaces above 1 mG (milliGauss) are considered high. When it comes to safety guidelines regarding magnetic fields, most regulatory agencies base their decisions off of either the ICNIRP guidelines or the IEEE recommendations. The ICNIRP has even stricter guidelines than the IEEE, and they recommend maximum exposure limits of 2000 mG.
Let’s give that a little bit of perspective. The Bioinitiative Report, which I hope you are familiar with, was a report written by 14 scientists from around the world, that summarized the findings of hundreds of studies related to the biological effects of EMF radiation on the body. In 2012, 29 scientists in total updated the report after reviewing 1800 additional studies, eventually publishing a nearly 1500 word report on these dangers. Although the Bioiniative Report had many conclusions, one of them was a recommendation of 1 mG for magnetic fields in living spaces. If you have a quality EMF meter like the Trifield TF2 that I use so often, you’ll probably notice readings in your home somewhere between .1 mG – 1 mG, usually hovering around .4 or .5 mG. These are the ambient levels that you’ll likely expect in a modern home. If you live in an apartment building, these will likely be even higher. So you can see how easy it is as you get closer to electronics that produce magnetic field radiation to expose yourself to levels higher than the safety recommendations of the Bioinitiative report. The reason I trust the 1 mG recommendation over the ridiculous 2000 mG recommendation of agencies like the ICNIRP is that it is based on unbiased research of nearly 30 scientists from around the world who summarized over 2000 studies related to the biological harm of EMF Radiation. After looking at all of these studies and working extensively to develop the report, they came to the conclusion that 1 mG the upper limit of what you should allow your body to be exposed to. New research that is coming out, such as a study from researchers at McGill University in Canada suggests that biological harm to the body could take place at levels even lower than 1 mG. However, there are many different estimates as to what are dangerous levels, and I don’t want to get too far off into the weeds. So, for now, it would appear that likely the most credible reading for dangerous levels of magnetic fields is likely anything above 1 mG. I also just want to note that this recommendation is based on ambient levels of habitable spaces, so where you actually spend most of your time. If you take your EMF meter and move it close to any electronic, especially electronics with motors, you will get readings far higher than this. For example, your computer could give you readings well over 100 mG if you are very close to it. That is why we use the inverse square law of physics, which essentially states that as we double our distance from a source of EMF radiation, we quarter our exposure to it. So any amount of distance you can get from radiation sources will exponentially lower your exposure. Which is why for the purposes of this article, we’re talking about ambient readings in a habitable space where you actually spend time, like your bedroom or living room. Summary: Electric field readings within living spaces above 10 V/m (Volts per meter) are considered high. Dangerous levels of electric field radiation are talked about much less than magnetic field and radio frequency radiation. Party this is because magnetic field radiation is more common and in some ways more pervasive than electric fields. Since this is a less talked about form of EMF radiation, there is less information about it, but I want to summarize the reason I concluded that ambient readings above 10 V/m are likely high. If you are walking around your home in areas, not near electronics like your television or your computer, you’ll likely get readings somewhere between 1 – 5 V/m. Let’s look at a few different research groups analysis of what is considered a high electric field reading. To clarify what these mean, here is their description of these categories. No Concern – This category provides the highest degree of precaution. It reflects the unexposed natural conditions or the common and nearly inevitable background level of our modern living environment. Slight Concern – As a precaution and especially with regard to sensitive and ill people, remediation should be carried out whenever it is possible. Severe Concern – Values in this category are not acceptable from a building biology point of view, they call for action. Remediation should be carried out soon. In addition to numerous case histories, scientific studies indicate biological effects and health problems within this reference range. Extreme Concern – These values call for immediate and rigorous action. In this category, international guidelines and recommendations for public and occupational exposures may be reached or even exceeded. Now for comparison, let’s look at a regulatory agencies version of what electric field readings you should be concerned with: 5000 V/m. Think about how extreme that difference is. If I place my EMF meter directly against an iMac that is actively running, I get electric field readings of around 400 V/m. This should tell you that these agencies limits are far off from what is a protective level. Based on my own understanding and research, It seems that the general consensus (especially in Europe) is that living spaces should be under 10 V/m at ambient levels. Anything above this is not certainly an immediate concern, but you should use your EMF meter to locate where the higher levels are coming from so you can resolve the exposure. Luckily, electric field readings are very stable, consistent, and fluctuate consistently with distance. So finding a source of Electric Field radiation in your home is very similar to the Hot and Cold game you may have played as a kid. If you are walking around your home and find levels higher than 10 V/m, start moving in one direction and if the readings go up, keep going, if not, go back to the start and try a different direction. Using this method you should be able to locate what electronics are emitting large amounts of radiation. Summary: Radio frequency readings within living spaces above 1 mW/m² (milliWatt per square meter) are considered high. Alright, now let’s take a look at one of the most damaging and pervasive types of EMF radiation, radio frequency. This is the type of radiation that cell phones, cell towers, WiFi, etc. expose you to. I just want to note here that if you’re using an EMF meter to measure RF radiation, be sure to look at the Peak number, and not the primary number on the screen. So for the Trifield TF2 that I often recommend, the peak number is located at the top left of the digital screen. The reason for this is that data when sent via radio frequency, is sent in packets, and not consistent like magnetic or electric field readings. So you need a meter that measures and displays these peak readings to actually get an understanding of how much radiation you’re exposing yourself to. Ok, now let’s talk a little bit about why I decided on the 1 mW/m² value as a high reading for RF radiation. First of all, this is the current conclusion of the Bioinitiative report. So first of all, to clarify, .1 µW/cm2 (microWatt per square centimeter) is equal to 1 mW/m² (milliWatt per square meter) just so you understand the conversions. So in that quote, they say new studies report biological effects in the range of 0.003 to 0.05 μW/cm2, which would equal .03 – .5 mW/m². Unfortunately, most regulatory agencies set safe levels for radio frequency exposure at levels 1000-10,000 times higher than these amounts. 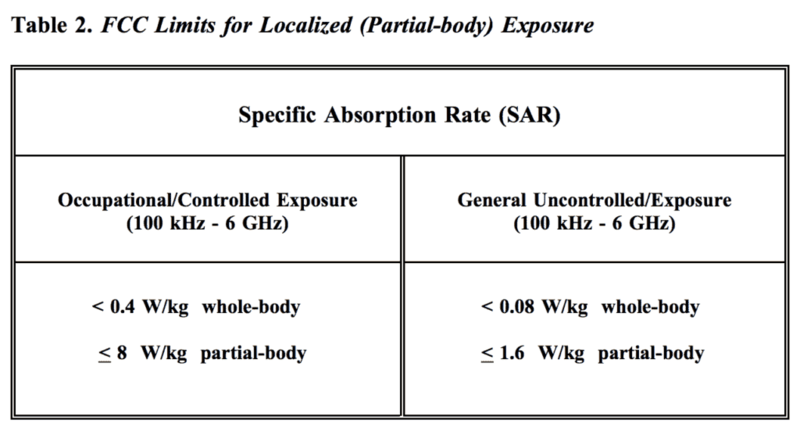 You’re probably most familiar with SAR, or Specific Absorption Rate, that I’ve written several articles on. Essentially SAR is the only government regulation that manufacturers of devices that emit radiofrequency radiation (like cell phones) have to comply with. For example, in the United States, all cell phones have to have a SAR rating of under 1.6 W/Kg. This means that the body can’t absorb more than 1.6 watts of energy, for every kilogram of body weight. Many phone manufacturers produce devices barely below this benchmark. However, as you can read in my articles, a growing number of scientists and researchers find these levels to be nowhere close to protective amounts. Take a look at the chart below, which was taken from this report by the Federal Communications Commission (FCC) about radio frequency radiation. The Occupational/Controlled portion is in relation to a job where your exposures may be higher, but that is by choice and can be controlled. The General Uncontrolled portion are maximum levels for the general public. You can see that for the “Partial-body” portion, it must be under 1.6 W/kg, which is why cell phone manufacturers must meet this standard. If you hold your EMF meter up to your cell phone, even if you’re just browsing the internet, you’ll notice spikes of up to 10 mW/m². This is far above what most researchers and scientists would conclude as a safe level. First of all, I just want to say that the conclusions and summaries in this article are my own opinion, and based on my own research and understanding, and should not be considered the be-all end-all of safety standards. The bottom line is all forms of EMF radiation in excessive amounts is extremely dangerous. If you have any devices in your home that you use often, I’d encourage you to check out my recommended products page for ideas of how you can protect yourself. Also, take a look at the many articles on EMF Academy for ideas on how you can reduce your exposure with simple changes. hi, Christian, after reading your website, I decided to purchase a trifield 2 meter. I have only had it for two days, but after checking the electrical reading of the I Home clock radio and the lamp beside my bed, I immediately unplugged them and moved the radio to another room because it also had a battery and was still giving high readings even with the battery. I am thrilled to say that the past two nights I have rested better than I have in years and awoke ready to get up and feeling fine. For the past several years, I have felt terrible on awakening and have even spoken to my Dr about it, because I am in very good health and could not understand why. Also, I guess that because of lack of good sleep, in the aftternoons I would just get so fatigued that I would sometimes need to lay down. Now I am 66 yrs. old but normally very active. Have also found several other sources of very high readings in the house. Now I need to read more and find out what I can do about some of it. Just wanted to thank you for your efforts on this website. The meter is very easy to use and just the good sleep alone has made it worth the price. I may have some questions later as I explore what to do about some of this. Thanks again!